Home » Posts » Dentistry » restorative dentistry » Digital impressions for fixed prosthodontics? Intra-oral digital impressions are increasingly available and have some advantages compared with conventional approaches in implant and fixed prosthodontics. The aim of this review was to compare marginal and internal fit of fixed dental restorations fabricated with digital techniques to those fabricated using conventional impression techniques and to determine the effect of different variables on the accuracy of fit. Searches were conducted in the Medline, Embase and Cochrane Central Register of Controlled Trials (CENTRAL) supplemented by hand searches of the journals International Journal of Prosthodontics, Journal of Prosthetic Dentistry, Journal of Esthetic and Restorative Dentistry, International Journal of Periodontics and Restorative Dentistry, European Journal of Esthetic Dentistry, and Journal of Prosthodontics. 11 studies (2 clinical, 9 in vitro) were included. The 2 in vivo trials were considered to be a medium risk of bias. Restorations fabricated in the digital impression groups showed a nominally smaller yet not statistically significant marginal gap than those fabricated in the conventional impression groups. Both marginal and internal gaps were greater for stone die casts, whereas digital dies produced restorations with the smallest gaps (P<.05). When a digital impression was used to generate stereolithographic (SLA)/polyurethane dies, misfit values were intermediate. The fabrication technique, the type of restoration, and the impression material had no effect on misfit values (P>.05), whereas die and restoration materials were statistically associated (P<.05). Dental restorations fabricated with the digital impression technique presented statistically similar marginal gaps compared with those obtained with the conventional impression technique. In digital impression groups, digital dies led to restorations with smaller marginal and internal gap compared with SLA/polyurethane dies. In regard to “pressing” and CAD/CAM fabrication techniques, similar results were found for both the marginal and the internal gap in conventional and digital groups. Glass-ceramics showed the largest internal gap compared with zirconia and metal alloy restorations in digital and conventional groups. In digital groups, metal alloy restorations showed the smallest marginal gap compared with glass-ceramics and zirconia restorations. Internal and marginal gaps between FDPs and SCs in both conventional and digital groups were similar. When polyether and PVS were used as the conventional impression materials, similar gap measurements were found for the restorations. This review has a clear methodological approach and includeds a good amount of information supplementary to the main paper. 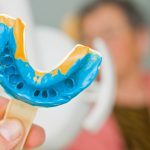 With growing interest in digital impression techniques it is a pity that only two small clinical studies are available, for it is in this context that detailed comparisons need to be conducted for potential users to evaluate. This current review together with earlier reviews of digital impressions for orthodontics does suggest that digital techniques may provide an alternative to traditional approaches at some time in the future but more and larger high quality clinical studies are needed. However the pace of change in the digital industries is rapid and even if shown to be a clinically effective method there may be a reluctant to adopt such a technology until a initial plateau of development has been reached. Chochlidakis KM, Papaspyridakos P, Geminiani A, Chen CJ, Feng IJ, Ercoli C. Digital versus conventional impressions for fixed prosthodontics: A systematic review and meta-analysis. J Prosthet Dent. 2016 Mar 2. pii: S0022-3913(16)00041-X. doi: 10.1016/j.prosdent.2015.12.017. [Epub ahead of print] Review. PubMed PMID: 26946916. Digital study models as reliable as traditional plaster models?